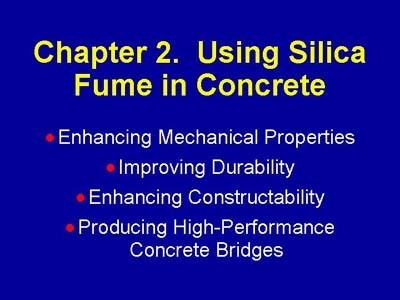 This chapter of the presentation describes the uses for silica fume in concrete. These uses fit into the general categories of enhancing mechanical properties, improving durability, enhancing constructability. A special use of silica fume is the production of high-performance concrete bridges where the strength and durability properties of the concrete are critical. This use of silica fume is also described. Although increasing concrete strength using silica fume has gained the most attention, more silica fume has actually been used in applications where increased durability is the driving factor. For the purposes of this presentation, the uses of silica fume have been divided into distinct categories. It should be remembered that adding silica fume will affect all concrete properties simultaneously. For example, reducing the permeability of concrete will usually increase the compressive strength of that concrete. The amount of increase will depend upon the concrete mixture selected. You should look at all aspects of concrete performance when specifications for silica-fume concrete are being written.